Why Choose Manhattan for Your Cinema Seating? Manhattan's cinema recliners are meticulously designed in Australia to give you the best possible value for money in home cinema seating. Using quality parts from around the world Manhattan have designs to suit every taste, and unlimited finish options to give you the only true custom finish to suit your personal style. All Manhattan chairs feature a premium motorised recliner mechanism as their foundation, providing a sturdy base for the chair to be built on. What’s more, they come with an ultra quiet ‘Stealth’ motor, barely audible even in a quiet cinema room. Power recline offers a huge advantage in that the chair stays put at the angle you choose, if you shift your weight the chair wont budge. The mechanism is designed for cinema usage. 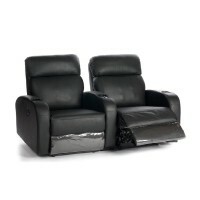 As you recline, the entire chair moves forwards allowing it to be placed very close to the back wall. 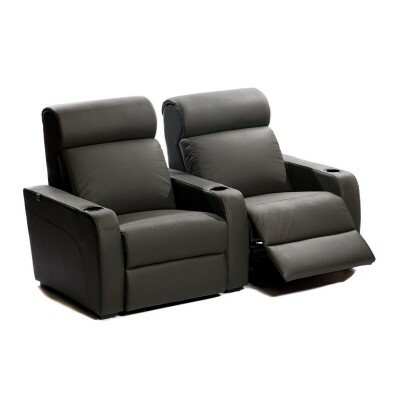 What’s more, the leg rest comes up first and this allows more flexibility in how far back you want to recline, allowing for more comfortable cinema viewing and ensuring your ear height does not change much, allowing for better calibration of your home cinema. The frame is perhaps the most important component to provide a long lasting chair. Manhattan's are hand made by skilled carpenters to ensure the best fit and finish, especially important in long rows. Using a solid wood frame will ensure many years of sturdy use. The consoles are all wood construction and every little detail has been thought through, even to the point where the storage compartment lid uses soft close hinges to stop it from slamming. Comfort is really important. Like the best beds on the market, Manhattan have adopted a market leading ‘pocket spring’ seat base, with each coil is in its own enclosure providing ultimate stability across the seat. The pocket springs are sandwiched between two layers of high-density foam. The whole base is then wrapped in an ultra-breathable cloth to allow airflow and easy drying for any spills. Of course they don’t stop there, the backrest and headrests are ultra plush. 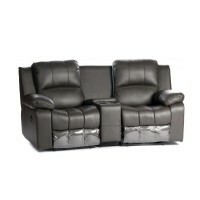 The armrests are positioned to allow for support and relaxation. Manhattan feel the ultimate test is to watch the client’s expression when they first sit in one of their chairs, almost always a smile from ear to ear. Manhattan only use top grain leather, no mid grade, no reconstituted, only the best, everywhere you touch. 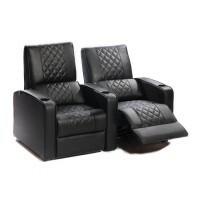 Leather is a great product for a cinema chair with a fantastic texture and softness, as well as being easy to clean. Of course, suede or fabric finishes are also available, which are especially popular for those living in colder climates providing a more natural warmth as well as a more affordable price. The stitch work comes as standard colour-matched to your chairs, but contrast stitching is also offered as a no cost option. Some client favourites are red on black (pictured), white on black, and black on white. Just another way you can personalize your chairs. We want these chairs to be all about you. As such, there is a huge list of options to make this possible. The most popular options are our chiller cup holder with integrated light and recliner buttons and the Crowson motion effects system allowing you to really feel the bass through the chair. But they don’t stop there, Manhattan can do fold out beds, Ottomans, and have even made dining chairs to match their recliners! Colour Swatches Available In Store! We have swatches available in store for all upholstery options. For our address and trading hours, please refer to our Store Location page.